Stratix 10’s Features and Functionality Will Revolutionise the Data Center and Networking Infrastructure Performance as the IoT Brings More Devices Online. I’m happy to announce Intel has started sampling to customers Stratix 10 field programmable arrays, the industry’s first 14nm FPGA. 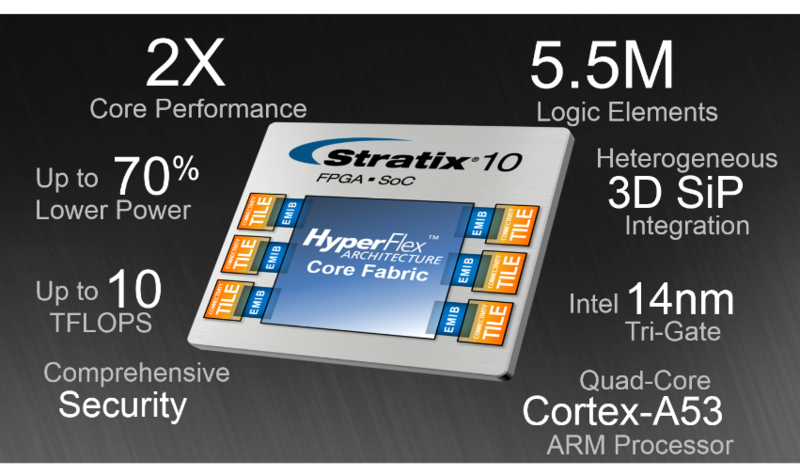 Stratix 10 combines the benefits of Intel’s 14nm tri-gate process technology with a revolutionary new architecture called HyperFlex to uniquely meet the performance demands of high-end compute and data-intensive applications ranging from data centers, network infrastructure, cloud computing, and radar and imaging systems. The features and functionality of Stratix 10 will revolutionise the performance of data centers and networking infrastructures, which must be able to support the rapidly growing number of devices coming online as the IoT explodes by the end of the decade. We live in a smart and connected world where billions of devices are creating massive amounts of data that must be collected, rapidly processed and analysed, and available from anywhere. With Stratix 10 FPGAs, Intel is enabling service providers, data centers, cloud computing and storage systems to satisfy their insatiable demand for higher computational capabilities, lower latency, greater system flexibility and increased power efficiencies. Why do we need to take IoT security more seriously?